﻿You gotta know when to send 'em. There are many different deadline types. We've listed some information for some of the most common below. 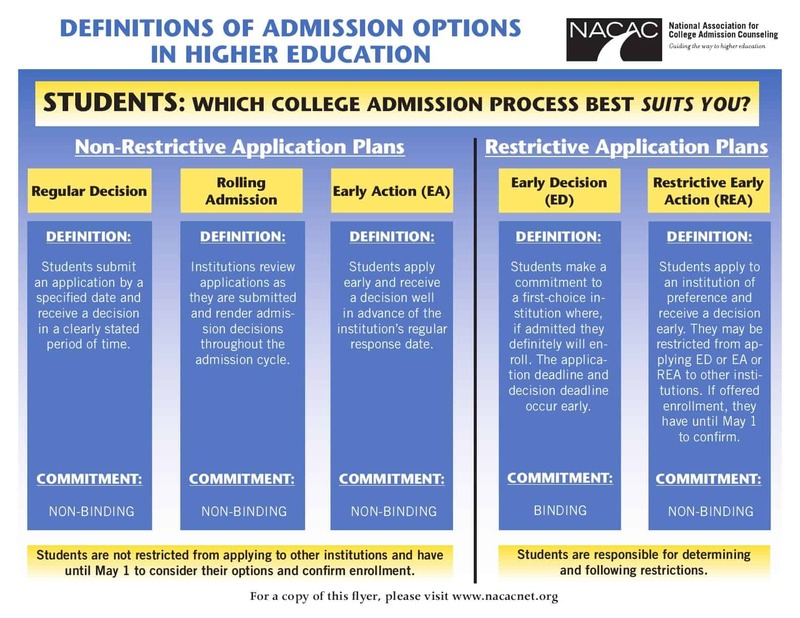 For more detailed information, check out this poster from the NACAC. This is a non-binding application. Regular decision deadlines are usually January 1 through February 15, with the majority on January 1. This is a non-binding application. Early Action deadlines are usually between October 15 and November 15, with the majority on November 1. You generally have a higher chance of admission if you apply by this deadline and are eligible for institutional-financial aid and scholarships. Can't decide EA vs. ED? Read this College Board article or check out this video. This is a binding application. Early Decision deadlines are usually between October 15 and November 15, with the majority on November 1. You must only apply to one Early Decision school. If you get in, you must go and must rescind all other applications. Rolling admissions schools will accept and examine applications as they are sent in, instead of waiting to judge all applications concurrently. Schools with rolling admissions can be great for late admissions, or for finding out early on whether or not you are accepted, so you can change your plan accordingly. Want more information? Read this Petersen's article. A public college or university whose admission is not binding. Want more information, read this Huffington Post article. For some universities, if you visit the campus after completing the application, the university will give you an admission decision upon your return from the tour. Want more information? See Longwood University's page.